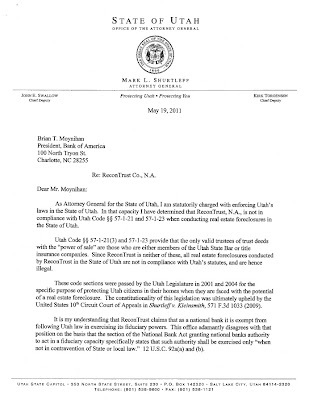 What does this mean will remain to be seen but it has the potential to overturn the foreclosures in the state of Utah and open up law suits. 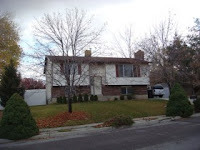 Sandy Davidson and I had a short sale that went back in foreclosure through the ReconTrust. 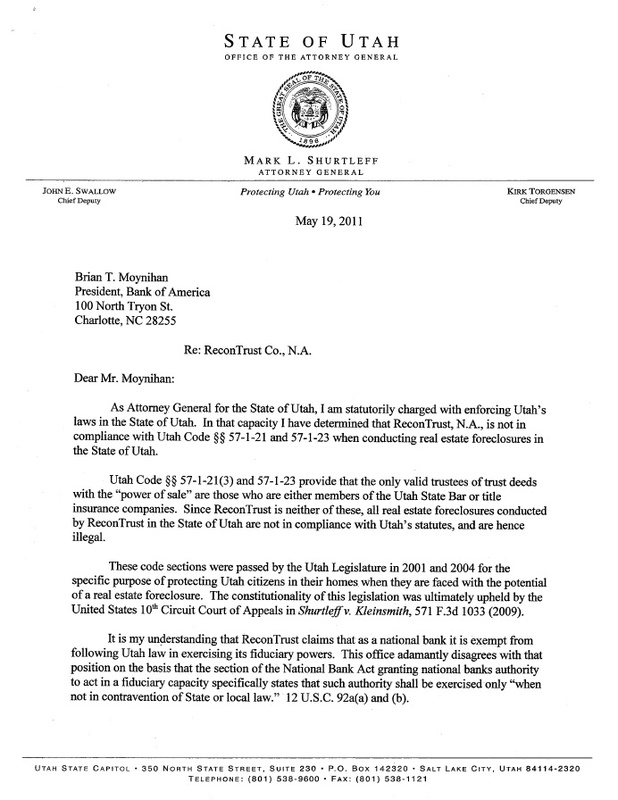 At that time we notified, the attorney generals office that they were doing illegal foreclosures. After 3 months they stopped using a notary to perform the foreclosures and started using an attorney but still they never stopped being the trustee. Here it is a year and thousand of foreclosures later, finally something. Attorneys can expect to be busy running after the pile of foreclosures performed by the ReconTrust. Please note that Utah State law states that an illegal foreclosure sale only creates a lien on the property and does not grant ownership. There are many different grant programs to choose from. Many of these programs do run out of money so you’ll need to check to see if they have funds available. The grant programs will vary in how much they give and what there guidelines are. The following is a list of grant programs and contacts. Please feel free to give me a have any question or if you are looking for a home. Lehi, Lindon, Orem, Payson, Pleasant Grove, Spanish Fork, Springville, Unincorporated Utah County. The maximum loan for a home 29 years or newer is $5,000 and the maximum amount for a home older than 30 years is $10,000. Provo City Only. 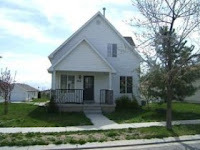 Home Purchase Plus: Up to $20,000 available in Pioneer Neighborhoods and Central Business District $10,000 available in all other areas of Provo. West Valley City provides down payment assistance to first-time home buyers purchasing a home within the West Valley City limits. 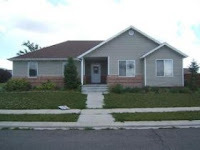 The Community Development Corporation of Utah (CDC) offers up to $10,000 or 6% of sale price, whichever is lower, in deferred loans to help finance the purchase of homes in the Magna and Kearns area. The loans are available to first-time home buyers to use for down payment assistance. The Community Development Corporation of Utah (CDC) offers down payment assistance grants to first-time home buyers in Utah, which can be used toward down payments, closing costs, or principal reduction. The amount of the grant is dependent on the location of the home. Only certain geographical areas have down payment assistance available. The current areas are Salt Lake City, Magna, Kearns, Sandy, and Taylorsville. NeighborWorks Salt Lake offers up to $10,000 in down payment assistance grants to first-time home buyers purchasing single-family homes in targeted neighborhoods within Salt Lake (see map). To earn the full $10,000, buyers must remain in the home for 10 years. How to make your house shine!! Here are some inexpensive solutions to spiff up your home without breaking the bank. To avoid having to sand and refinish your hardwood floors try Bona cleaner & floor polish. It's a urethane polish that you will have to wait about 2 hours to walk on. It's worth the wait. To clean up your cupboards try Krud Kutter and Howard's Restore a finish. Use the Krud Kutter only if you really need to, it's for the grimy dirty corners that get all of the goo. Apply the Krud Kutter to the cabinet than rub with some 000 Steel wool, then wipe with a clean cloth. Apply the Howard's restore a finish to the cupboard with the steel wool if it is bad, if not I recommend to use a clean cloth. After you apply the Restore a finish wipe with a clean cloth. To clean up and care for your Granite or stone counter tops use Stone Care International, just spray and clean. For the sealer you need to spray and wait for a little while and then wipe with a clean dry cloth. People are coming over and you have clothes and toys all over and you have no time to clean. Take a yard trash bag and fill it up. Than throw it in a closet that they wont look in to or the garage. No one thinks twice about a garbage bag in the garage. Then simply put the items a way when you have time. We like to call this one the "Trash bag theory". You are trying to sell your home. Keep refrigerated cookie dough or bake products on hand and before they come over cook some cookies and set them out on a plate. The smell of baked goods help people feel like this is there home. The mental moving van is not far behind. These hints can help you avoid making some costly repairs and help your home sell. So you may be wondering what the market is doing now that you have noticed that Utah is #7 in foreclosures in the country. We have a larger number of short sales than most states. Single family average sales price: $240,973 -10.73% Change from 2008. Days on market: 92 21.05% Change from 2008. Number of homes sold: 1176 17.60% Change from 2008. New listings: 3250 -20.91% Change from 2008. Average % of new listings sold: 42.52% 40.02% Change from 2008. New average asking price: $273,067 -14.32% Change from 2008. The average single family sales price has dropped from the 2nd quarter of 2008 by 10.73%. Contributing to this, is the high number of short sales we have in this state and the number of bank owned homes. To compete with the short sales, sellers are having to reduce their sales prices. The days on market has gone up by 21.05%. This contributing factor to this can be, the short sales take 90+ days to negotiate with bank. There are multiple offers on most short sales. If a home is well priced (price below market value) they will have multiple offers on them. This is true of bank owned homes and short sales. The average number of single family homes sold went up by 17.60% from 2008. This shows possible signs of the market bottoming. The average number of listings went down by 20.91%. This shows the inventory is going down. The factors in this may be that sellers are holding on for the market to return and the number of homes selling going up. The average % of new listings sold went up by 41.02%. The sellers and banks are more aggressively marketing their homes for sale by choosing sales prices that are below the average or are at current market value. The average asking price wend down by 14.32%. Sellers and banks are using current comparable and are aggressively marketing their homes for sale. The number of bank owned and short sales on the market can contribute to this as well. Please feel free to give me a call, email or text me if you have any questions. $8,000 Tax Credit Clock Is Ticking!! Run do not walk to your closest real estate agent! The deadline for buying a house and getting the $8,000 tax credit is coming! It will be here before you know it! The Deadline is November 30, 2009. You must close on your house by November 30th to get the tax credit. That would mean you would have to have a house under contract by October 31st., as it takes 30 days to close a loan. You cannot have owned a house within the last 3 years. You need to live in the house for 3 years otherwise you will have to pay the $8,000 back. There are other grant programs available that you can take advantage of in purchasing a home with little to no money down. Yes, $0 down payment loans and programs do exist. It's not as hard to buy a home as you may think. Buy a HUD home with only $100 down. Yes, you really can buy a home with only $100 down!! You can buy a HUD home with only $100 down payment!! HUD will pay up to 3% in closing costs. Here is the catch, you have to buy it at full asking price. It would also be an FHA loan. There are some good HUD deals out there. There are more out there. 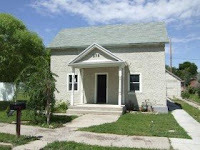 Call, email or text me if you would like a list of other HUD homes.